(Nanowerk News) The blue-rayed limpet is a tiny mollusk that lives in kelp beds along the coasts of Norway, Iceland, the United Kingdom, Portugal, and the Canary Islands. These diminutive organisms — as small as a fingernail — might escape notice entirely, if not for a very conspicuous feature: bright blue dotted lines that run in parallel along the length of their translucent shells. Depending on the angle at which light hits, a limpet’s shell can flash brilliantly even in murky water. Now scientists at MIT and Harvard University have identified two optical structures within the limpet’s shell that give its blue-striped appearance. The structures are configured to reflect blue light while absorbing all other wavelengths of incoming light. The researchers speculate that such patterning may have evolved to protect the limpet, as the blue lines resemble the color displays on the shells of more poisonous soft-bodied snails. The findings, reported this week in the journal Nature Communications ("A highly conspicuous mineralized composite photonic architecture in the translucent shell of the blue-rayed limpet"), represent the first evidence of an organism using mineralized structural components to produce optical displays. While birds, butterflies, and beetles can display brilliant blues, among other colors, they do so with organic structures, such as feathers, scales, and plates. The limpet, by contrast, produces its blue stripes through an interplay of inorganic, mineral structures, arranged in such a way as to reflect only blue light. The researchers say such natural optical structures may serve as a design guide for engineering color-selective, controllable, transparent displays that require no internal light source and could be incorporated into windows and glasses. Kolle, whose research is focused on engineering bioinspired, optical materials — including color-changing, deformable fibers — started looking into the optical features of the limpet when his brother Stefan, a marine biologist now working at Harvard, brought Kolle a few of the organisms in a small container. Stefan Kolle was struck by the mollusk’s brilliant patterning, and recruited his brother, along with several others, to delve deeper into the limpet shell’s optical properties. To do this, the team of researchers — which also included Ling Li and Christine Ortiz at MIT and James Weaver and Joanna Aizenberg at Harvard — performed a detailed structural and optical analysis of the limpet shells. They observed that the blue stripes first appear in juveniles, resembling dashed lines. The stripes grow more continuous as a limpet matures, and their shade varies from individual to individual, ranging from deep blue to turquoise. The researchers scanned the surface of a limpet’s shell using scanning electron microscopy, and found no structural differences in areas with and without the stripes — an observation that led them to think that perhaps the stripes arose from features embedded deeper in the shell. To get a picture of what lay beneath, the researchers used a combination of high-resolution 2-D and 3-D structural analysis to reveal the 3-D nanoarchitecture of the photonic structures embedded in the limpets’ translucent shells. What they found was revealing: In the regions with blue stripes, the shells’ top and bottom layers were relatively uniform, with dense stacks of calcium carbonate platelets and thin organic layers, similar to the shell structure of other mollusks. However, about 30 microns beneath the shell surface the researchers noted a stark difference. In these regions, the researchers found that the regular plates of calcium carbonate morphed into two distinct structural features: a multilayered structure with regular spacing between calcium carbonate layers resembling a zigzag pattern, and beneath this, a layer of randomly dispersed, spherical particles. The researchers measured the dimensions of the zigzagging plates, and found the spacing between them was much wider than the more uniform plates running through the shell’s unstriped sections. They then examined the potential optical roles of both the multilayer zigzagging structure and the spherical particles. Learn how MIT researchers identified the two optical structures that give a limpet shell its blue-striped appearance. Kolle and his colleagues used optical microscopy, spectroscopy, and diffraction microscopy to quantify the blue stripe’s light-reflection properties. They then measured the zigzagging structures and their angle with respect to the shell surface, and determined that this structure is optimized to reflect blue and green light. The researchers also determined that the disordered arrangement of spherical particles beneath the zigzag structures serves to absorb transmitted light that otherwise could de-saturate the reflected blue color. From these results, Kolle and his team deduced that the zigzag pattern acts as a filter, reflecting only blue light. As the rest of the incoming light passes through the shell, the underlying particles absorb this light — an effect that makes a shell’s stripes appear even more brilliantly blue. The team then sought to tackle a follow-up question: What purpose do the blue stripes serve? The limpets live either concealed at the base of kelp plants, or further up in the fronds, where they are visually exposed. Those at the base grow a thicker shell with almost no stripes, while their blue-striped counterparts live higher on the plant. Limpets generally don’t have well-developed eyes, so the researchers reasoned that the blue stripes must not serve as a communication tool, attracting one organism to another. Rather, they think that the limpet’s stripes may be a defensive mechanism: The mollusk sits largely exposed on a frond, so a plausible defense against predators may be to appear either invisible or unappetizing. The researchers determined that the latter is more likely the case, as the limpet’s blue stripes resemble the patterning of poisonous marine snails that also happen to inhabit similar kelp beds. 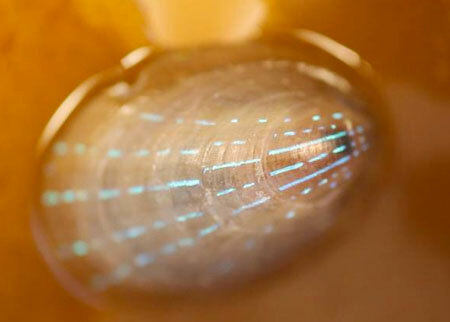 Kolle says the group’s work has revealed an interesting insight into the limpet’s optical properties, which may be exploited to engineer advanced transparent optical displays. The limpet, he points out, has evolved a microstructure in its shell to satisfy an optical purpose without overly compromising the shell’s mechanical integrity. Materials scientists and engineers could take inspiration from this natural balancing act. Peter Vukusic, an associate professor of physics at the University of Exeter in the United Kingdom, says the researchers “have done an exquisite job” in uncovering the optical mechanism behind the limpet’s conspicuous appearance.